Coulson and Richardson's Chemical Engineering has been fully revised and updated to provide practitioners with an overview of chemical engineering. Each reference book provides clear explanations of theory and thorough coverage of practical applications, supported by case studies. A worldwide team of editors and contributors have pooled their experience in adding new content and revising the old. The authoritative style of the original volumes 1 to 3 has been retained, but the content has been brought up to date and altered to be more useful to practicing engineers. This complete reference to chemical engineering will support you throughout your career, as it covers every key chemical engineering topic. 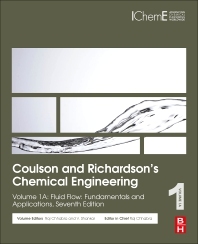 Coulson and Richardson’s Chemical Engineering: Volume 1A: Fluid Flow: Fundamentals and Applications, Seventh Edition, covers momentum transfer (fluid flow) which is one of the three main transport processes of interest to chemical engineers. Raj Chhabra earned his BS, MS, and PhD degrees, all in Chemical Engineering, from the erstwhile University of Roorkee (now IIT Roorkee) in 1974, the Indian Institute of Science, Bangalore (1976), and Monash University, Melbourne, Australia (1980), respectively. Following a postdoc with the late Professor J.F. Richardson at the University of Swansea, Swansea (UK), in 1984, he joined as an assistant professor in the Department of Chemical Engineering at the Indian Institute of Technology Kanpur in India. Currently, he is a professor in the same department. His research interests are in the area of multiphase systems, especially involving non-Newtonian fluids. He has more than 300 journal papers to his credit. In addition, he has authored/coauthored four books.